In the whirling noise of our advancing technological age, we are seemingly never alone, never out-of-touch with the barrage of electronic data and information. Felicity Aston, physicist and meteorologist, took two months off from all human contact as she became the first woman -- and only the third person in history – to ski across the entire continent of Antarctica alone. She did it, too, with the simple apparatus of cross-country, without the aids used by her prededecessors – two Norwegian men – each of whom employed either parasails or kites. Aston’s journey across the ice at the bottom of the world asked of her the extremes in terms of mental and physical bravery, as she faced the risks of unseen cracks buried in the snow so large they might engulf her and hypothermia due to brutalizing weather. She had to deal, too, with her emotional vulnerability in face of the constant bombardment of hallucinations brought on by the vast sea of whiteness, the lack of stimulation to her senses as she faced what is tantamount to a form of solitary confinement. 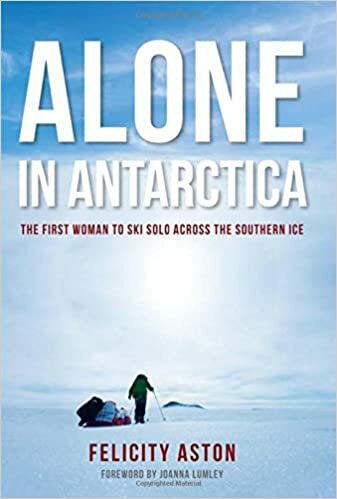 Like Cheryl Strayed’s Wild, Felicity Aston’s Alone in Antarctica becomes an inspirational saga of one woman’s battle through fear and loneliness as she honestly confronts both the physical challenges of her adventure, as well as her own human vulnerabilities.